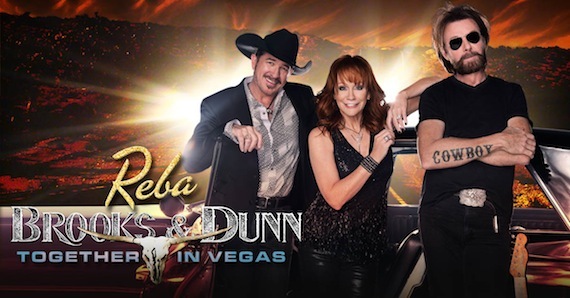 Reba, Brooks & Dunn: Together in Vegas will continue through 2017. Twelve new shows were announced today (Nov. 30) and go on sale Friday (Dec. 2) at noon PT. The extension will make Reba, Brooks & Dunn the longest-running country music residency at The Colosseum since the venue opened in 2003. Presented jointly by Caesars Entertainment and AEG Live, the show premiered in June 2015 and has played over 30 concerts. The two-hour production features more than 30 hits. Tonight, the artists return to The Colosseum to kick off their last run of shows in 2016. Reba and Brooks & Dunn first toured together in 1993. Ticket prices are $205/ $155/ $105/ $85/ $59.50 at thecolosseum.com.